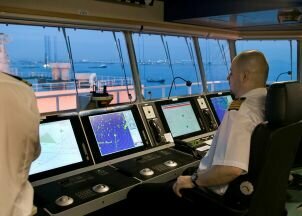 ГлавнаяМорское ЧтивоShip NavigationNavigation Equipment and ResourcesWhat is Integrated Bridge System (IBS) on Ships? An Integrated Bridge System (IBS) is a combination of systems, which are interconnected to allow a centralized monitoring of various navigational tools. IBS allows acquiring and control of sensor information of a number of operations such as passage execution, communication, machinery control, and safety and security. Integrated bridge system (IBS) is a kind of navigation management system which links other systems to provide all the details pertaining to ship’s navigation at one place. It is to note that not all types of ships have the same type of IBS. The system would vary according to the design of the ship’s bridge, various types of equipment used by the ship, and general layout of the equipment of the bridge. According to SOLAS, the Integrated Bridge System should be arranged in such a way that failure of one subsystem does not cause failure of any other sub system. It should also be possible to operate each other equipment attached to the IBS individually or as a part of the system. Moreover, on failure of any sub system, an integrated alarm system must provide a suitable warning to the officer on watch (OOW) of the potential threat. In most ships, an additional alarm connected to the IBS is also fitted in the cabins of navigational officers. This alarm provides a signal in the cabins within 30 seconds in case the officer in charge fails to acknowledge an alarm. Though IBS is an excellent system for navigation, officers on watch shouldn’t completely rely on the equipment but should pay proper attention to visual navigational watch keeping techniques as well. Also, proper guidelines should be provided on the bridge manual as to when to use and when not to use the Integrated Bridge System (IBS). IBS is not mandatory on ships.